¶ The chips on this page are not casino chips. Rather they are casino quality, fantasy commemorative poker chips, made through the efforts of Bill Borland some 15 years ago. Today they are obsolete and highly collectible. ... .... .... I noticed this pattern to the chips (disregarding variations in the size of edge spots): (a) the chips cover 10 casinos; five of the casinos have sets of 7 chips ($1, $5, $25, $100, $500, $1000 and $5000); the other 5 casinos have sets of 9 chips ($1, $5, $25, $100, $500, two $1000's (one with edge spots; one with "pie") and two $5000's (one with edge spots; one with "pie"); those that have both pie and edge spots, the color combinations of the pie and edge-spot chips are esentially the same; (b) the $1 and $5 chips have two edge spots (except the $1 Dunes chip which has no edge spots); (c) the $25 and $100 chips have three edge spots; (d) the $500 chips have four edge spots; and (e) the $1000 and $5000 chips have either four edge spots or are pie. .... ....... ........ The above picture is of a cardboard advertising display for Borland's chips. The back of the display is pictured at the bottom of this page. 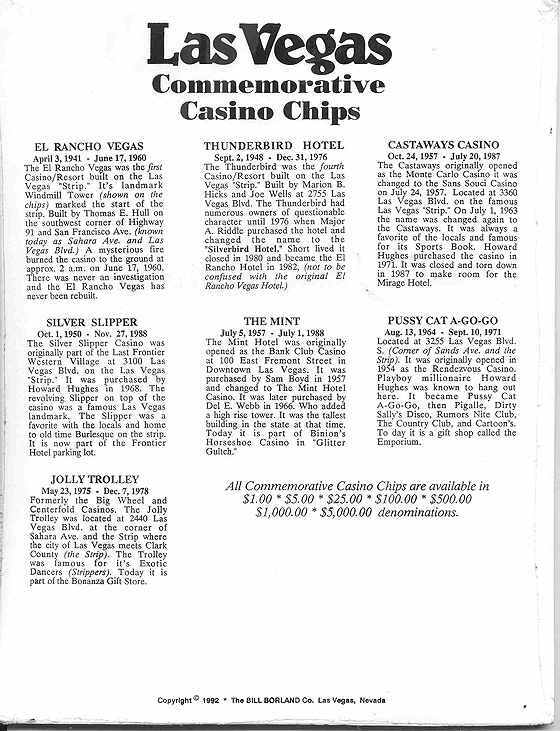 Note the inscription "copyright 1992, The Bill Borland Co. ... .... ." Note also that only 7 of the 10 casinos are cited, and only those casinos have pie $5000 chips; the missing three casinos have only edge-spot $5000 chips. ¶ I am especially indebted to David Spragg, who made the scans of the chips on this page and let me use them here. 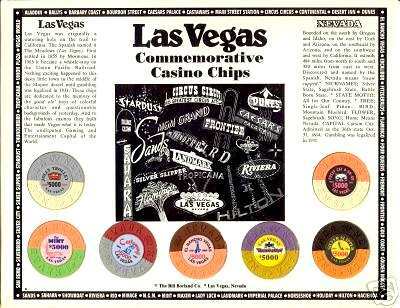 The history of the Borland chips, the Chip Rack Nevada codes, his scans and descriptions of the colors of all the chips can be seen on his Web page and the Web page he maintains for the Casino Chip and Gaming Token Collectors Club. In August 2005, I changed the code numbers to comform to the new number arrangment devised by David. ...... ...... ....... 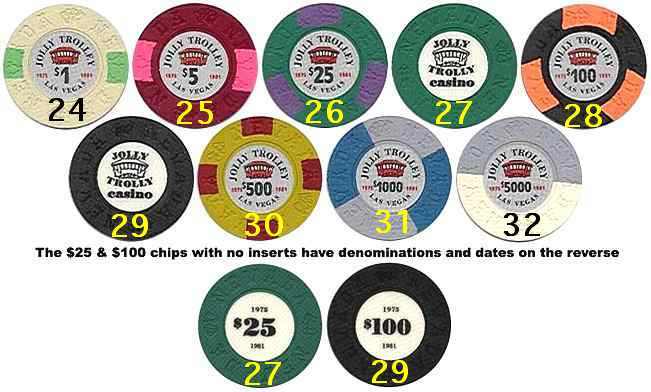 Note: In the pictures, below, where it says "Re-orders with 1/2" inserts," it means that when Bill Borland (in the early 1990's) depleted the first issue of these chips, he re-ordered some more chips with a change in the size of the inserts. Incidentally, all of the code numbers that have an "a" suffix (eg., 15a) have 1/2" inserts. ¶ CHIPS I NEED: In the tables below, I indicate which chips are missing from my collection by a notation in the "Comments" column.. ..... ....... ........ 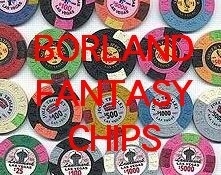 I am also in the market to buy any of the Borland chips for my inventory. inlay OK, but clay is faded, $15 price ... ... ...I have one in mint condition for $20. The chip is pictured twice above to show the 2 sides. I don't consider this chip as part of this series, but the chip was made by Borland, and the casino dates are on one side. ... ..... I don't have this chip in my personal collection, need it! The chip is pictured twice above to show the two sides. I don't consider this chip as part of this series, but it was made by Borland, and the casino dates are on one side. black; 3/8" inserts. --only a few of these are known to exist. It is similar to #47b, just that it is black, not dark navy blue. Both have 2 red edge spots. dark navy blue; 1/2" inserts.